Available on Amazon in both a square and round version. Here is a link to the square version. This is a Bgraamiens puzzle that appears to have been manufactured by Panley Paper. The puzzle comes in a sturdy square box that is just the right size for the pieces. I was very drawn to this beautiful image from the minute I saw it. The pieces have a nice glossy finish and are sturdy, a nice size to work with, and without any defects. There was almost no puzzle dust in the box. 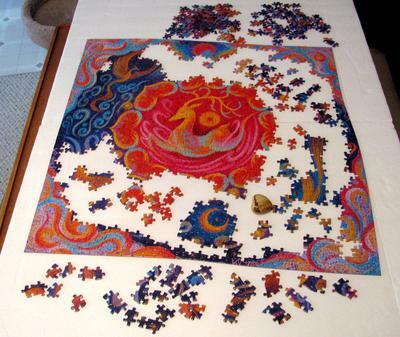 The pieces are color-coded on the back with the addition of circles that allow the puzzler to sort the pieces into various sections of the puzzle to work on, or to turn over assembled pieces to check that they have correct placement. Pieces are random cut and there is a nice variety to piece shape without having super weird cuts or cuts that make pieces vulnerable to breaking. The fit to the pieces is quite nice. I was easily able to flip the entire puzzle over when completed to take a photo of the back color coding. 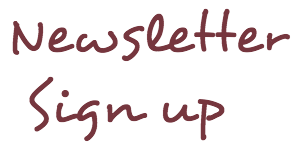 Difficulty level depends on whether you opt to use the color-coding or not. When not using it, the challenge level is quite high given the repeating patterns in the puzzle. I would plan to devote considerable time to assembly. When using the color-coding, the challenge level still remains above a medium difficulty level. I found the deer and surrounding hearts to be the most challenging part of the puzzle. Once those parts were assembled, I moved through the rest of the sections more easily. 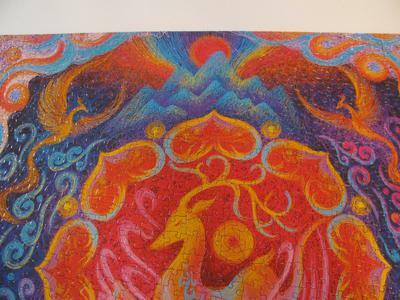 When you successfully complete this puzzle, you will be amazed by the beauty of the finished puzzle. 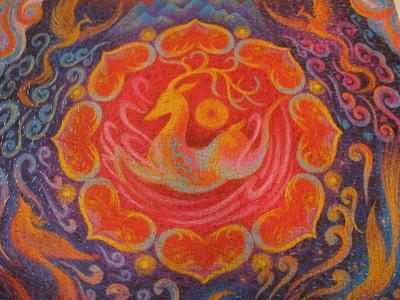 The colors are vibrant and the artwork is quite exquisite. A full size reference poster would be a nice addition to this puzzle but overall a great puzzle if you have the patience for a challenge. 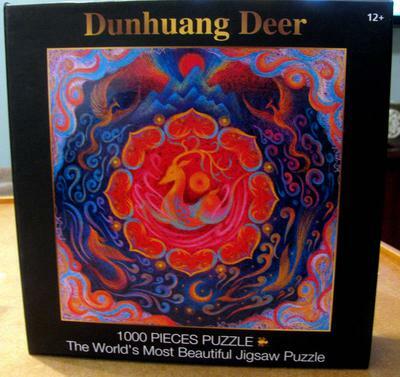 Comments for DUNHUANG DEER 1,000 PIECES BY BGRAAMIENS. This is quite unique Julie and the colors are very vibrant too. I like the idea of color coded on the back for the purpose of making the puzzle easier for those who love the image but shy away from difficult puzzle. Great review here, thanks Julie.